The NTX1000 appears to be a high quality turntable at a steal of a price - we'll bring you a review as soon as we can. 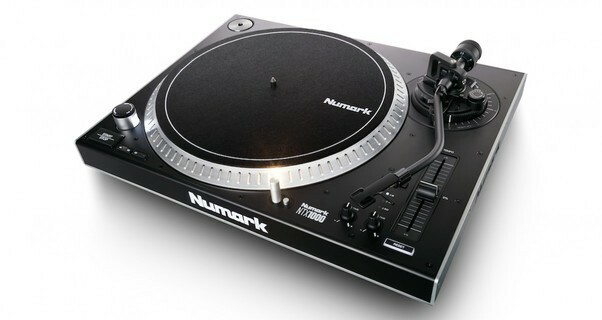 Numark just announced a new, high-torque direct-drive turntable, the NTX1000. It has an S-shaped tonearm, variable pitch range of ±8, 16 and 50%, and comes with a cartridge-mounted headshell, allowing you to get going right out of the box. It has been priced keenly to compete with the likes of the Pioneer DJ PLX500. Hand-in-hand with the resurgence of vinyl DJing and record sales in turn, it is no surprise to see Numark offering up a new professional DJ turntable. As usual, it is modelled on Technics’ classic SL1200 design and packs an impressive 4kg of start-up torque, which allows the platter to get to full speed in less than 0.7 seconds (same as SL1200 MK2). On the back, alongside sockets for detachable RCA cables, you will find a USB output, perfect for connecting to a computer to convert your records to your digital format of choice. In what has become Numark’s niche, this looks to be a solid way for you to get the pro features of a more expensive turntable in a more cost-effective manner, and it's sure to spark the interest of both those just starting out DJing and those who fancy an upgrade on their current set-up. We’re certainly looking forward to putting this turntable through its paces. • The NTX1000 comes with an RRP of US$399, with the expected release date in the third quarter 2017. DJ Shadow Dubai won Best DJ at The Masala Awards 2018! AIDC awarded Silver Play button from Youtube!